^ 2.0 2.1 O'Connor, Kevin. The History of the Baltic States. Greenwood Publishing. 2003: 15. ISBN 0313323550. ^ 3.0 3.1 3.2 3.3 3.4 3.5 3.6 3.7 3.8 3.9 Dubonis, Artūras. Belated Praise for King Mindaugas of Lithuania. Mindaugo knyga: istorijos šaltiniai apie Lietuvos karalių. Lithuanian Institute of History. 2005: 17–22. ISBN 9986-780-68-3. （原始内容存档于2011-09-28）. ^ 4.0 4.1 Baranauskas, Tomas. The Formation of the Lithuanian State. Lietuvos valstybės ištakos. Vaga. 2000: 245–272 [2009-02-20]. ISBN 5-415-01495-0. The Volhynian Chronicle gives the following description of Mindaugas' activity: Mindaugas "was a duke in the Lithuanian land, and he killed his brothers and his brothers' sons and banished others from the land and began to rule alone over the entire Lithuanian land. And he started to put on airs and enjoyed glory and might and would not put up with any opposition." ^ （立陶宛文） Jonynas, Ignas. Bychovco kronika. (编) Vaclovas Biržiška. Lietuviškoji enciklopedija III. Kaunas: Spaudos Fondas: 875–878. 1935. ^ Stone, Daniel. A History of East Central Europe. University of Washington Press. 2001: 3. ISBN 0295980931. ^ 7.00 7.01 7.02 7.03 7.04 7.05 7.06 7.07 7.08 7.09 7.10 7.11 7.12 Sužiedėlis, Simas (编). Mindaugas. Encyclopedia Lituanica III. Boston, Massachusetts: Juozas Kapočius: 538–543. 1970–1978. LCC 74-114275. ^ （立陶宛文） Ivinskis, Zenonas. Ringaudas. Lietuvių enciklopedija 25. Boston, Massachusetts: Lietuvių enciklopedijos leidykla: 308–309. 1953–1966. LCC 55020366. ^ 10.0 10.1 10.2 10.3 （立陶宛文） Salys, Antanas. Mindaugas. Lietuvių enciklopedija XXVIII. Boston, Massachusetts: Lietuvių enciklopedijos leidykla: 493–495. 1953–1966. LCC 55020366. ^ 11.0 11.1 （立陶宛文） Zinkevičius, Zigmas. Senosios Lietuvos valstybės vardynas. Vilnius: Science and Encyclopaedia Publishing Institute. 2007: 48–49. ISBN 5-420-01606-0. ^ Frucht, Richard C. Eastern Europe: An Introduction to the People, Lands, and Culture. ABC-CLIO. 2005: 169. ISBN 1576078000. ^ 13.0 13.1 13.2 Urban, William. The Prussian-Lithuanian Frontier of 1242. Lituanus. Winter 1975, 4 (21) [2009-02-17]. ISSN 0024-5089. ^ 15.0 15.1 Bojtár, Endre. Foreword to the Past: A Cultural History of the Baltic People. Central European University Press. 1999: 179. ISBN 963-9116-42-4. ^ 16.0 16.1 16.2 16.3 16.4 Jakštas, Juozas. Lithuania to World War I. (编) Albertas Gerutis (ed.). Lithuania: 700 Years. translated by Algirdas Budreckis. New York: Manyland Books. 1969: 43–58. LCC 75-80057. ^ Rowell, S.C. Baltic Europe. The New Cambridge Medieval History, c.1300–c.1415 VI. Cambridge University Press. 1995: 705. ISBN 0521362903. ^ 18.0 18.1 18.2 （立陶宛文） Kiaupa, Zigmantas. Baltų žemių vienijimosi priežastys. Gimtoji istorija. Nuo 7 iki 12 klasės. Vilnius: Elektroninės leidybos namai. 2002 [2007-03-11]. ISBN 9986-9216-9-4. ^ 19.0 19.1 19.2 19.3 19.4 19.5 19.6 19.7 （立陶宛文） Lietuvos valdovai (XIII-XVIII a. ): enciklopedinis žinynas. Vytautas Spečiūnas (compiler). Vilnius: Mokslo ir enciklopedijų leidybos institutas. 2004: 15–78. ISBN 5-420-01535-8. ^ 21.0 21.1 Rowell, S. C. Lithuania Ascending: A Pagan Empire Within East-Central Europe, 1295-1345. Cambridge Studies in Medieval Life and Thought: Fourth Series. Cambridge University Press. 1994: 51–52. ISBN 9780521450119. ^ Dvornik, Francis. The Slavs in European History and Civilization. Rutgers University Press. 1992: 215. ISBN 0813507995. ^ 23.0 23.1 John Meyendorff. Byzantium and the Rise of Russia. Cambridge University Press, reprinted by St Vladimir's Seminary Press, 1989. 1981: 56. ISBN 9780881410792. ^ History of the Catholic Church in Lithuania. Catholic Church in Lithuania. [2009-02-20]. ^ （立陶宛文） Semaška, Algimantas. Kelionių vadovas po Lietuvą: 1000 lankytinų vietovių norintiems geriau pažinti gimtąjį kraštą 4th. Vilnius: Algimantas. 2006: 510. ISBN 9986-506-90-4 请检查|isbn=值 (帮助). ^ （立陶宛文） Lietuvos Respublikos švenčių dienų įstatymas, Žin., 1990, Nr. 31-757, Seimas. Retrieved on 2006-09-17. ^ Kajackas, Algimintas. The History and Recent Archeological Investigations of the Vilnius Cathedral. Lituanus. Spring 1990, 1 (36). ISSN 0024-5089. 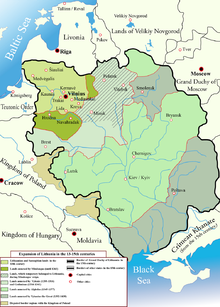 ^ Rowell, S.C. Lithuania Ascending: A Pagan Empire Within East-Central Europe, 1295-1345. Cambridge Studies in Medieval Life and Thought: Fourth Series. Cambridge University Press. 1994: 149. ISBN 9780521450119. ^ （立陶宛文） Gudavičius, Edvardas. Mindaugas. Vilnius: Žara. 1998. ISBN 9986-34-020-9. ^ （立陶宛文） Zabiela, Gintautas. Lietuvos medinės pilys. Vilnius: Diemedis. 1995: 175. ISBN 9986-23-018-7. ^ Reserve – Archaeological Site. Administration of the State Cultural Reserve of Kernavė. [2009-02-05]. ^ The Gimpse on the History of Klaipeda Port. Klaipeda State Seaport Authority. [2009-02-24]. （原始内容存档于2009-02-17）. ^ O'Connor, Kevin. Culture and Customs of the Baltic States. Greenwood Publishing. 2006: 42. ISBN 0313323550. Unlike the insincere conversion of the Lithuanian chief Mindaugas in 1251, Jogaila's embrace of Christianity, although strategic to be sure - it was the price he paid for the Polish crown - was permanent. ^ 36.0 36.1 Ignatow, Gabriel. Transnational Identity Politics and the Environment. Lexington Books. 2007: 100. ISBN 0739120158. ^ Plokhy, Serhii. The Origins of the Slavic Nations: Premodern Identities in Russia, Ukraine, and Belarus. Cambridge University Press. 2006: 91. ISBN 0521864038. ^ Marcinkevičius, Justinas. Honor and Suffering, The Second Part of the Drama-Poem Mindaugas. Lituanus. Winter 1971, 4 (17) [2009-02-20]. ISSN 0024-5089. ^ Lieven, Anatol. The Baltic Revolution. Yale University Press. 1993: 47. ISBN 0300060785. ^ （立陶宛文） Nikžentaitis, Alvydas. Gediminas. Vilnius: Vyriausioji enciklopedijų redakcija. 1989: 8. OCLC 27471995. 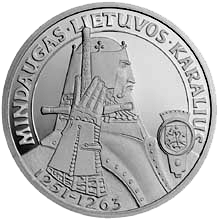 ^ Celebrations in Honor of Mindaugas the King (PDF). Lithuanian American Community, Inc. [2009-02-24]. （原始内容 (PDF)存档于2009-03-05）. ^ Polish President pleased with the opportunity to celebrate the anniversary of King Mindaugas’ coronation together with the people of Lithuania. President of the Republic of Lithuania. [2009-02-24]. ^ Lithuania's Cooperation with Estonia. Foreign Ministry of Lithuania. [2009-02-24]. ^ （波兰文） Juliusz Słowacki. Polski Słownik Biograficzny. XXXIX/1: 58–73. 1999. （原始内容存档于2009-03-04）. ^ Šešplaukis, Alfonsas. Shakespearian Traits in Lithuanian Literature. Lituanus. Fall 1970, 3 (16) [2009-02-15]. ISSN 0024-5089. ^ Dundzila, Audrius Vilius. King and Power. Lituanus. Spring 1990, 1 (36) [2009-02-08]. ISSN 0024-5089.